Red diesel and diesel fuel is the lifeline of many agricultural businesses in the UK. They power the tools and machinery which are needed daily. Keeping them safe should be a priority when you’re storing them in large quantities on your farm or site. With the majority of farms and agricultural businesses located in rural areas, they’re often an easy target for thieves looking to line their own pockets. As well as expensive farming and construction machinery, fuels and oils are also targeted which can quickly be sold on quickly and easily with little hope of tracking it back to the original owner. If your farm or agricultural business uses and stores large quantities of and red diesel fuel. It’s an unfortunate necessity, but securing and protecting your machinery and fuels should be a top priority. You can avoid or at the very least, limit the chances of becoming a victim of these types of thefts by following a few simple measures to secure your red diesel from fuel thieves. 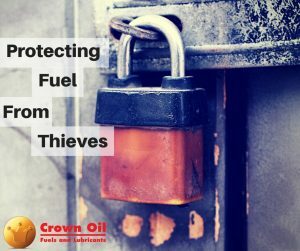 The many news stories about fuel thefts are a harsh reminder to remain vigilant and ensure your property is safeguarded against fuel thieves. If you’re worried about the security of your current fuels and oils storage and believe you could be doing more. Here at Crown Oil, we’ve supplied our range of storage tanks and containers to all types of businesses and organisations, as well as to homes using heating oil. Red diesel and white diesel (DERV) theft can seriously impact your businesses or organisations ability to operate for the initial hours or even days until the lost fuels can be replaced. Causing a huge amount of disruption to your business, with an additional cost to replace the fuels and lost money and working hours. If you’d like further advice and information on effective ways to secure your fuels and oils and further information about our range of storage containers. Our friendly team will be happy to discuss your requirements to see how we can best help you. Simply call us today on 0845 313 0845.
secure your red diesel from fuel thieves.